Key Takeaway: ISIS is executing a sophisticated, multi-front campaign against Libya’s oil facilities, demonstrating the organization’s growing capability abroad. President Obama reportedly ruled out significant military intervention against the group as of February 18. The administration opted to continue intermittent strikes against ISIS leaders in Libya instead, such as the strike on an ISIS leader in western Libya on February 19. This surgical approach is unlikely to defeat the group, which maintains more than 5,000 fighters and is reinforced by leadership sent from Iraq and Syria. Libyan ground forces are also unlikely to expel ISIS from its areas of control. ISIS’s safe haven in Libya will allow it to survive even if it is defeated in Iraq and Syria. ISIS will use its Libyan base to exacerbate regional disorder and likely to attack Europe. ISIS has executed an aggressive campaign to take over territory in the midst of Libya’s post-revolution civil war. ISIS deployed a contingent of 300 Libyan ISIS militants from eastern Syria to spearhead the creation of a new ISIS affiliate in Libya in mid-2014 as part of a larger strategy to seize terrain and exacerbate disorder outside of Iraq and Syria. ISIS established this affiliate in Sirte, on the central Libyan coast, in early 2015 and has since advanced outward from the city, capturing population centers and establishing checkpoints to its east, west, and south. ISIS has exploited the seams between the participants in Libya’s civil war and established itself amidst the conflict’s frontlines, taking over territory when no local forces are positioned to defend it. This approach mirrors ISIS’s military expansion and development of safe havens in Syria and Yemen, demonstrating the threat posed by the regional adoption of ISIS’s way of war. ISIS now possesses a contiguous zone of control that includes a more than 200 km stretch of Libya’s coast, which ISIS confirmed as part of its Caliphate in August 2015. ISIS maintains between 5,000 and 6,500 fighters in Libya, according to the Pentagon’s latest count. The group is now both defending its stronghold in Sirte and pushing outward, imposing its rule on the population as it grows by establishing governance structures and enforcing shari’a law. U.S. leaders including Secretary of Defense Ashton Carter have acknowledged that ISIS’s Libya affiliate is chief among the organization’s increasingly dangerous “metastases” abroad. ISIS’s leadership is dedicating significant resources to Libya, as evidenced by its complex, multi-front campaign on the country’s oil production facilities. ISIS’s central leadership has deployed leaders from Iraq and Syria to Libya to strengthen governance, consolidate control, and develop operational design and capabilities. The group is currently conducting a campaign against Libya’s oil resources and security that aims to both perpetuate instability in the country and set conditions for ISIS to capture Libya’s oil wealth. ISIS likely seeks to gain access to oil revenue in Libya, as it has done in Iraq and Syria where revenue from black market oil trade is a significant source of funding for the group’s military and governance efforts. ISIS launched a campaign in early January 2016 on the oil fields east of its stronghold in Sirte in pursuit of this objective. ISIS’s ground forces took complete control of a village to the east of Sirte, where it had previously maintained a light presence, and used it to stage sustained attacks on oil export terminals at Ras Lanuf and al Sidra, as well as on inland oil infrastructure. The group executed coordinated attacks across multiple populated areas during the oil fields campaign, including a suicide truck bomb at a police training camp in Zliten that killed at least 60 and wounded at least 200. This bombing, along with several attempted follow-on attacks, targeted territory held by the Misrata-based militias that previously fought against ISIS’s takeover of Sirte and were likely intended to prevent attacks on Sirte as ISIS executed the oil campaign. ISIS also attacked oil infrastructure near Zueitina, far to the east of the al Sidra frontline, signaling coordination between militants based in both central and eastern Libya. ISIS has yet to take control of operational oil infrastructure in Libya. 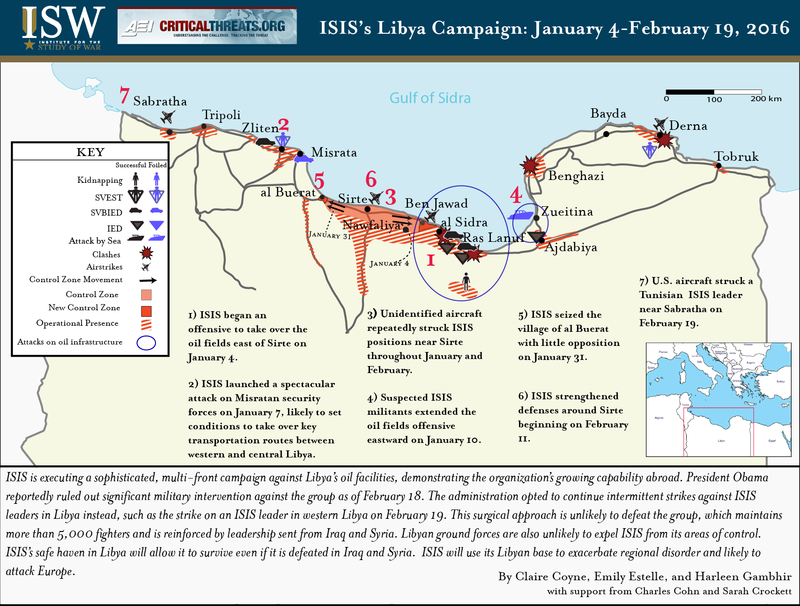 However, its January 2016 campaign successfully exercised the Libyan affiliate’s capability to design and execute a complex campaign and established support zones for future attacks on oil fields, making it the group’s largest and most successful ground operation outside of Iraq and Syria to date. This preparation, combined with ISIS’s recruitment of engineers to Libya, signals that the group will launch more operations aimed at controlling Libya’s oil infrastructure. No Libyan actors are poised to roll back ISIS’s territorial gains in Libya. Libya does not have a unified national army, and its highly factionalized armed groups remain locked in a multidimensional civil war. The transitional government that assumed power after the fall of longtime dictator Muammar al Qaddafi in 2011 failed to bridge the country’s political and tribal fault lines and ultimately broke down into two warring parliaments, each supported by loose coalitions of armed groups. The UN is struggling to bring the two parliaments together behind a unity government, but the ongoing stalemate and uncertain status of key powerbrokers in the future government are preventing majorities on both sides from agreeing, and thus the armed groups from uniting. ISIS’s rapid expansion in Libya has proved insufficient to force Libya’s political leaders to abandon their grievances. At the same time, no existing Libyan fighting force has demonstrated either the will or the capability to defeat ISIS in their country. The Libyan National Army (LNA), aligned with the House of Representatives based in the east, is embroiled in a stalemated fight against a plethora of Islamist groups in Benghazi, Derna, and Ajdabiya. The LNA has used its very limited air power to conduct sparse strikes on ISIS positions, but its forces are entrenched in their current fights and unable to launch a ground assault on ISIS in Sirte. Meanwhile, a coalition of Misratan militias from western Libya recently mobilized eastward toward Sirte, but these forces, combined with those already based closer to Sirte in Abugrein, likely number around half of the force that ISIS can muster to defend its stronghold. It is more likely that the Misratans, who have established checkpoints at key transport hubs and near ISIS positions west of Sirte, are attempting to contain ISIS’s westward expansion. The U.S. and its allies lack both the partner and the will to carry out a campaign the scale needed to defeat ISIS in Libya. The absence of a unity government and a Libyan army hampers action against ISIS by denying the international community legitimate political and military partners for intervention. The U.S. has reportedly ruled out the possibility of intervening in Libya unilaterally, as U.S. defense officials claimed on February 18 that President Obama rejected a plan from U.S. Africa Command and Special Operations Command to launch airstrikes against ISIS’s resources in Libya and deploy Special Operations Forces to train a future Libyan national army. The U.S. reportedly will continue to strike ISIS’s high-level leadership in Libya instead. For example, the U.S. targeted a Tunisian ISIS operative in western Libya linked to major terror attacks in Tunisia on February 19. Such surgical, opportunistic targeting will not expel ISIS from populated areas or prevent the group from advancing further. Denying ISIS safe haven in Libya requires a ground partner capable and willing to clear and hold ISIS’s current areas of control. ISIS will continue to grow and strengthen in the absence of a determined response from both Libyans and the international community. ISIS will use its enduring safe haven in Libya to endure and project disorder throughout North Africa and potentially into Europe. A Libyan stronghold allows ISIS to survive in the event of defeat in Iraq and Syria by providing two key capabilities: a physical safe haven that can serve as a refuge for central leadership, and a safeguard for ISIS’s ideological legitimacy, which depends on the governance of a territorial Islamic state. ISIS has already used Libya as a support zone for devastating attacks on tourist sites in neighboring Tunisia, and its recent uptick in North Africa-focused propaganda indicates that the group is still focused on generating recruitment and attacks in the region. ISIS’s secure hold on terrain in Libya allows it to more easily develop networks and project attacks into neighboring Tunisia, Algeria, and Egypt, as well as recruit throughout the Maghreb and Sahel regions. ISIS may ultimately use its safe haven within Libya to plan and launch attacks on nearby Europe, as it has already done with its safe havens in Iraq and Syria.